I am interested in monochrome ink based printmaking, carbon transfer, photopolymer gravure and inkjet. I work with both digital and large format film. Sometimes I pretend to take people on photography tours in Fiordland, New Zealand. Certainly, there are many theories. Bear in mind that it may not be possible to actually know, but this is my take. I am alive, the world shows up for me. I am a process, a body that senses, feels and acts. I am unique, as are you. All life appears to conform to an underlying pattern, yet no two living things are identical. I appear to use my senses to construct maps that help me to relate to my surroundings. The maps I make appear to be predictions. I predict the territory I live in. The rectangular Dell monitor I am looking at in this moment is full of letters, symbols, words and ideas. That is a constructed reality, it is really just a grid of tiny lights. Our people have created that meaning and shared it or passed it down to us. You may be looking at an objectively identical Dell monitor, I have no way of knowing if you see exactly the same thing, even if its colour is properly calibrated, you are different to me, but we do have a common language and set of concepts. In our seeing, we predict and then correct with better prediction as required. Some people have trouble predicting and others have trouble correcting but most of us get it pretty right most of the time, otherwise we would all drive into each other on the motorway or live in a disconnected world. All of this construction appears to be happening outside of conscious awareness. We just see. There are people that think images and the ideas they contain precede language. There are also image concepts that relate to language. So potentially when I look at a tree, I am constructing an image of a tree concept. It appears that I am able to generate a cascade of detail recursively, the image of the tree becomes more and more detailed and closer to objective reality the closer I look. However, there are some things I don’t know about trees and a botanist could help me to see a tree in much more detail. If I know that I don’t know something, I can see it if I look. You help me to see things that I don’t know that I don’t know. There is a limit to the resolution of what I can experience directly but I can use tools to see more deeply, though indirectly. Emotional granularity, which is learned, influences the granularity of our seeing. Movement also influences seeing. Why do I see? In my opinion, we see in order to act or move. Seeing is a spatial awareness. I think we see with our whole being, not just the eyes but also ears, taste, touch, hearing, smell movement, feeling. Emotions influence our seeing. Emotional granularity, which is learned, influences the granularity of our seeing. Movement also influences seeing. Old me sees differently to young me because old me has different movement possibilities. Hip hop dancers see differently to classically trained ballet dancers because they have different movement libraries or maps of space. It is interesting to me that great artists are often students of emotion and movement. I think we could generalise and call enquiry into movement and emotion, the study of relationship. When we make a photograph we are using a machine to record in 2 dimensions a multi dimensional scene that is directly related to some reality. When I see, the relationship to reality is through my conditioning. There is a feedback loop going on between camera and photographer, our seeing frames the image and the camera informs our seeing. We can change our picture, or we can allow our picture to change us. In photography, there is always some direct relationship in space. I think we can include time (or possibly the temporal resolution of spatial relationship) in this word ‘space’, perhaps colour too might be thought of in terms of space. All of those describe a quality of movement or my relationship to the world I construct for myself. Both the photographer and viewer of a photograph are negotiating a constructed space. When I look at a photograph, it’s a construction I see. I am using my concepts to map out a piece of paper with silver or ink on it, or a grid of lights, into something that represents reality. The key point for me is that I am seeing, in the context of ‘photograph’, with all of my assumptions and biases. The concepts I bring to viewing a photograph are cultural, learned. 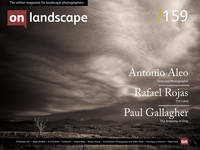 Look at the style of photography submitted to On Landscape and what you see is a cultural norm. Often the same can be said of an art gallery. Perhaps a business person would call that branding. Identification is an important part of being alive. My photography is an exploration of the relationship. I aspire to create when I feel least sure of myself. I want my photography to come from within me, I try not to rely on artifice. For me, the holy grail is print as gestalt, something that exists as its own concept, independent of the language of our art form. If there were a photographer whose work I admire the most, in this context, it would be Paul Caponigro, who looked at a mundane apple and saw a universe of stars. I aspire to create when I feel least sure of myself. I want my photography to come from within me, I try not to rely on artifice.